OmniThreadLibrary now supports the Delphinus package installer. If you are using Delphi XE or newer, you can install Delphinus, select OmniThreadLibrary, and click Install. Delphinus will do the same steps GetIt does: download OTL, recompile and install package, and add proper paths to the search and browsing path. Source will be installed to c:\Users\Public\Documents\Embarcadero\Studio\<release>\Comps\. 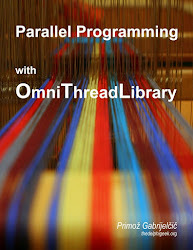 If you are not using OmniThreadLibrary yet, or if you are only using its low-level parts (CreateTask and company), I’m kindly inviting you to a 20-minute presentation “Simple Parallel Programming with Patterns and OmniThreadLibrary”, which will be transmitted as a part of the Embarcadero Technology Partner Spotlights series on September 3rd. There are three timeslots to chose from so I’m sure everybody can find a suitable time. After the first two presentations I’ll be handling Questions and Answers and Jim McKeeth has kindly offered to do the job for the third presentation as it will be around 02.25 AM here when it is finished. If you want to see something interesting and new, register here! Just a quick note – OmniThreadLibrary 3.04b is now available on XE8 via GetIt. I have updated the Parallel Programming with OmniThreadLibrary book with the Miscellaneous chapter. The book is now almost complete! It does not help that I don’t have all those Delphis installed on my computer. Most of them are only installed in a VM. And it takes a looooong time to start up a VM, run tests, power it down, start up next VM, and so on. And when I fix something, I have to retest it all …. This kind of testing hurts. So in the manner of the Continuous Integration mantra, I decided to do it more often.